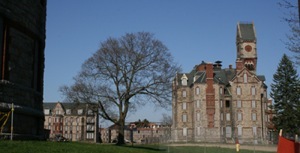 Medfield State Hospital was built in 1896 and closed in 2003. According to the Asylum Project website “Medfield State Hospital claimed to be the first mental health hospital to be built on the “cottage plan” with individual buildings to allow for better light ventilation, easier classification, and to create a more homelike environment.” It currently sits abandoned but is open to the public to walk around the grounds. The buildings are locked and many condemned. While it is listed on the National Registry of Historic places, several of the buildings have been demolished. The campus has also been used for filming such films as Shutter Island and The Box.